1Department of Pharmacology, Saveetha Dental College and Hospital, Saveetha Institute of Medical and Technical Sciences, Saveetha University, Chennai, Tamil Nadu, INDIA-600 077. 2Department of Genetics, University of Madras, Chennai, Tamil Nadu, INDIA. Background: Increasing resistance of microorganisms against available antimicrobial agents is of major concern among scientists and clinicians worldwide. To overcome the resistance and other drawbacks of the current antimicrobial drugs and to obtain more efficacious drugs, an antimicrobial drug having a novel mode of action should be developed. The flavonoid compounds have demonstrated for their therapeutic potential as antimicrobial agents previously. Aim: To evaluate the antifungal efficacy of plant derived compounds such as hesperetin (HSP) and silibinin (SBN) compounds in vitro. 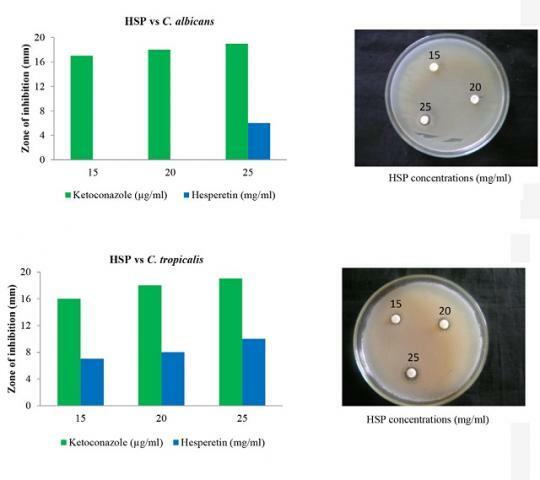 Materials and Methods: In this study, we evaluated the antifungal effect of two plant derived flavonoid compounds i.e., SBN and HSP against Candida albicans, Candida tropicalis, Malassezia furfur, Aspergillus niger, Penicillium oxalicum. The disk diffusion test was performed to test the antifungal effect of HSP and SBN with three different concentrations i.e., 15, 20, 25 mg/ml of HSP and SBN. The antifungal efficacy was studied for 72 h. Results: Our results indicate that SBN has significant antifungal effect than that of HSP. The high sensitivity of these compounds was found against C. albicans, C. tropicalis. Conclusion: These drugs could be good candidate to combine with regular antimicrobial agents. Gowtham R, MA FY, Ezhilarasan D, Sambantham S, Anandan B. In vitro Antifungal Effects of Hesperetin and Silibinin. Pharmacognosy Journal. 2018;10(4):789-792.